This month I had the pleasure of being reunited with Cordelia Spence, whom I have worked with before on several theatre trailers for her previous plays ‘The Poisoners’ Pact‘ and ‘The Blacksmith Who Chased The Moon‘. Additionally I got to work again with Thomas Wingfield who stars in my short film ‘Love Bitten‘, as well as Kiara Hawker from the former trailer. As with my other theatre trailers, I always try to find the film adaptation within each play. With a play as original as this, written by Ray Rumsby, it was exciting and daunting to try and put such prestigious and under-appreciated historic figures on screen. With the brief screen time I get to build, I tried to articulate the emotional intensity of these people’s lives, but focusing on the recognisable: love, hatred, disapproval and defiance. This year I was asked to take part in National Youth Film Academy’s Introductory Course as a director. I didn’t know much about the course upon accepting my place, only that they seemed to have a good track record of getting exciting industry speakers in for workshops, which at the very least would teach me a thing or two. I could never have expected the journey ahead of me at the time. What followed were two weeks of intense filmmaking, with a super-talented team, under the guidance of Oscar Nominee and NFTS’s resident Scriptwriting Teacher Rafael Kapelinski. We were split into four groups, each with a director, one or two writers, crew, eight actors and a group leader. One of the biggest challenges i shared in with the writers was scripting a 15-minute short film with 8 characters; even more so when considering the capabilities of all the actors, which would have been murderous to have underused. Rafael pushed myself and writers Zoe Hunter Gordon and Emily Rose Nabney further and further to the point where we were still working on the screenplay through the weekend after the first week when all other groups had started filming. We knew that there was not worth shooting, if we had nothing worth shooting. After starting production on the monday we still knew that the project needed work and even changed the screenplay mid-way through the shoot before sailing through the rest of the film with lightning speed as D.O.P Richard Scott quickly worked to discover the set way to use natural light for the visual benefit of each scene. What was nice as a director was working with the actors front he first day of scriptwriting through to the end of production, building their characters with them from the ground up so the world was shaped around them rather than desperately attempting to give quick in-cognitive instructions for characters they didn’t understand. The work we did with the actors allowed us to shoot the film in an authentic and genuine way which really emphasises the fun and games as well as the darker undertones of the piece. I will be able to share more on the project soon, as he film is the property of the NYFA and they are responsible for festival submission an distribution, but for the time being here is a teaser poster. Audition, why 16:9 widescreen and not 2.35:1 anamorphic? We shot the film with the view that it was likely to be cropped down to 2.35:1. The Nikon d800, like all other DSLR shoots at 16:9, 1080p. A lot of films, shorts included, are cropped to 2.35:1 (anamorphic). This gives it the distinct cinematic feeling, so why, when most of my earlier films are anamorphic, stick to widescreen? For those that don’t know the difference, an anamorphic aspect ratio or crop is responsible for the black bars at the top and bottom of videos (such as movie trailers) on websites such as YouTube. This is because YouTube by default features a 16:9 video player. We framed a lot of the shots for anamorphic, but during the edit I fell in love with the taller picture. It gave a sense of an uncompromising view of the horror, like their was nothing being hidden. A lot of the rooms we shot in were square so to show from head to toe we’d have had to have stepped even further from the action. There’s one particular shot where Beaufort stands with all these dead bodies in front of him, the initial idea was to focus on his blade wielding hand and the bodies, but there was something more disturbing about the full picture. The 16:9, tv aspect ratio called back to memory older Hitchcock movies and TV movies which use more practical special effects than visual effects, which is exactly what we did with the film. In addition the main audition sequence is constructed through the use of two close-ups, cross cut, which strips away the environment and focuses on the action. These were purposely framed really tightly so you find yourself, as an audience member, being stuck in the middle of this dark engagement, scared for Cherry the auditionee and seduced by Beaufort the villain. Cropping would have taken away some of the upper forehead detail or lower mouth movement and this reduced the view of exactly what we were focusing on. In the end the framing and presentation worked better in standard widescreen, and knowing that the film would be released online there was no point in using an anamorphic crop as a shortcut to a cinematic look. The lighting, the performances and the drama should create the performance on their own accord and that’s what we hope to have achieved. I will be returning to the anamorphic aspect ratio for my next film ‘Glove Compartment‘. So after more than a year I have changed the design of my website once again. Why? To shift the focus back to the content. I wanted my work to be front and centre so people can understand my visual edge as a filmmaker much quicker. I hope to update this blog much more regularly. Each post will be posted my new site as well as on my wordpress site. I would like to encourage people however to use this website foremost as means to read my blogs as it keeps you close to the content, but for the foreseeable future I see no reason not to utilise both platforms. 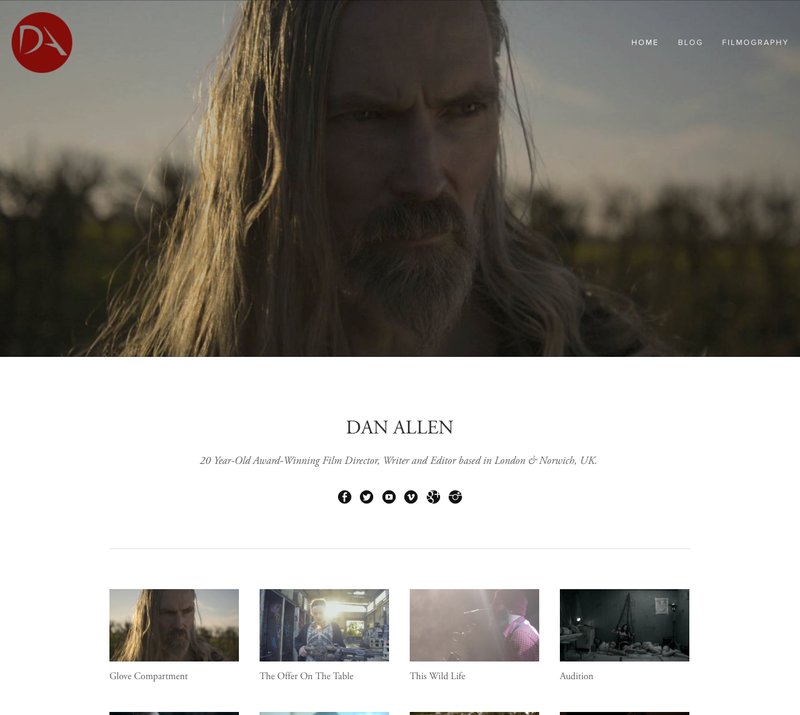 The only other page on the menu bar on my new site is the filmography, a quick way to see all my credits, view my showreel and find external links. The one stop shop for all things Dan Allen. Over the coming months I am looking for ways to incorporate more of my YouTube and Final Cut Pro X work onto my website as whilst my websites have always been used as a platform to showcase my film work, my FCPX Training has become a big part of my work and i want that to be reflected on my online portfolio. One side note is that until my main domain is transferred over, my ‘.com’ address redirects to the true domain of ‘.net’, although I am hoping for the site to be hosted at both domains soon. Anyway, please use the contact form on my website to submit any issues or bugs you find on the website – there is a contact link at the bottom of every page. So today i wanted to take the opportunity to formally introduce my latest short film ‘Audition’. The script was written by Richard Anthony Dunford, who’s previous script ‘Cupidity was Directed by BAFTA winning nominated Michael Ferns. We have an array of great talent working on the project, from my brother Tom Allen, Director of Photography, to Jamie Weston, Art Director as well as Christopher Hanson who is working on the score. Clive Double on Make-Up and SFX, and Arabella Clarke also on Make-Up whilst Marcel is on sound dept along with Tristan Syrett. Josh Faux is also offering his creative mind and exhaustive efforts to the project as well as woring hard on the film titles! Not to mention the incredible cast! The film stars Carey Thring (From Hell – starring Johnny Depp) as Beaufort the estranged new film director and Lauren Shotton who played Pansy Parkinson in many of the Harry Potter films. The film also sees the return of Louise Ann Munro who has appeared in two other film’s of mine ‘Husky’ and ‘The Unofficial Minecraft Advert’. As with ‘The Karate Kid Complex’, the online delivery will be delayed due to the delivery to several film festivals first, so it wont be online till later this year at the earliest, but the film’s online presence starts now: There will be new behind the scenes videos every month, delivered to my YouTube channel ( http://YouTube.danallenfilms.com ) and via the monthly newsletter which you can sign up to now at http://mailinglist.auditionshort.com which will also feature any news mentioned on this blog. In addition there will be several trailers released, the first of which will be delivered this week (again, via my YouTube or via the Newsletter). If we find ourselves in the position of being able to share the film with the general public sooner then we will jump at the opportunity. For my YouTube people and other techy’s, we shot the film on the Nikon D800, and edited and finished in FCPX – A later behind the scenes video will cover our complete workflow. The behind the scenes videos will be made up of interviews, set footage, outtakes and production diaries! The first one will be out at the end of February! 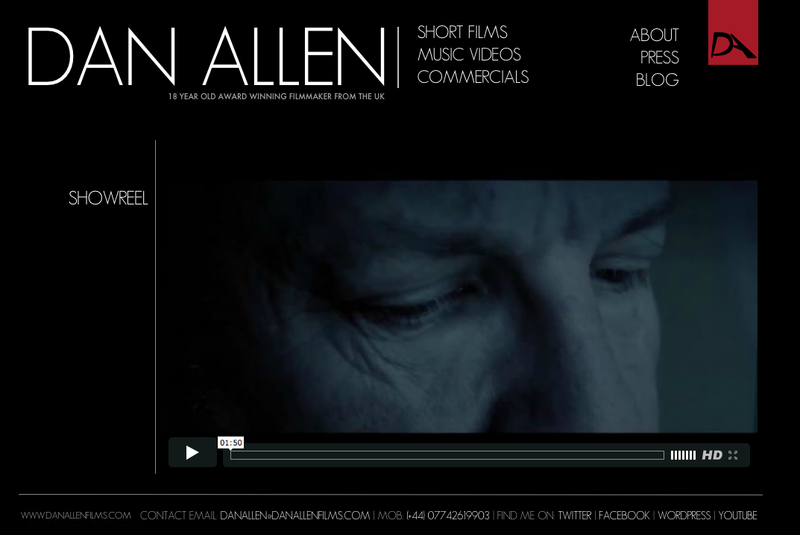 For regular, shorter updates you can always follow my Official Facebook page ( http://facebook.com/danallenfilms ) or my twitter @asproductions or simply ensuring you are subbed to my YouTube as I often upload blogs there. There will be some form of launch event (fingers crossed) for the online delivery but we really need help from all of you in sharing the BTS videos and sharing news and updates from Facebook posts, forwarding emails and sending the videos to as many websites as possible. We need you to help run the PR machine of this film because the power of the internet is in community so hopefully, when all is said and done, there will be a film available online for all of you to enjoy for free, reaching a wide audience because we all helped make it so! Last Sunday we finished shooting a brand new short film, called ‘Audition’, directed by myself and written by Richard Anthony Dunford. Further Light for ‘The Dark and Light’, and ‘Mondays’… again! I am pleased to share that my short film ‘The Dark and light’, which was produced as part of a BFI Bursary Scheme last year, was nominated for the Best Genre Film at the Cinemagic Film Festival 2012. Cinemagic is a very special festival for me because it is where I won my first every award for my first ever short film END (which is still available online here). So it was great to be welcomed back into the Cinemagic Lineup of sort. I really wished i could have attended this year but was unable to. The Dark and Light was a really interesting film for me because it was considerably more experimental than the traditional Dan Allen scripted film. I am currently working on developing a script from a very talented writer which i cannot wait to tell you more about. I always see collisions as being more productive than symmetry; that is to say that my interaction with his material could prove extremely exciting. Nonetheless i will always continue to develop my own material and scripts in the wings. I have just completed work on my latest short film ‘The Karate Kid Complex’. I wrote this short nostalgic / comedy abotu Jnauary time and the plan was to enter it into the virgin Media Shorts competition, but after several setback and other projects ans well as studies the script was put to the shelf for the time being, but was always of prominant interest as some form of ‘pet project’ of mine. Its very short (less than two and a half minutes) but within the timespan aims to be enjoyable, charming, emotional, thrilling and humourous – quite ambitious i guess. But, by following aristotles basic formulea for drama i believe it is always possible to condense these ideas into a shorter duration by enuring a tight and well constructive narrative form. For such reasons i was rather pleased that ‘The Karate Kid Complex’ quickly became a viable option for virgin media shorts submission again. The film is about a boy, Nigel Winters, who takes karate lessons in order to overcome his bullies who have made his life a perpetual torment. The basic idea was to follow a basic line of cliche’s and ‘cheese’ in order to fulfill a hollywood-esc design in terms of story, narrative and character. But then, at the ast minute to suddenly deviate away from convention and throw a curveball at the audience, designed for humorous effect. Everythign about the productiona nd its design employs these conventionas and emotive experience, whilst, on a personal level, trying to acheive a far greater level of production value than was possible with the likes of Husky, given that they both effectively ahd the same budget, but vary considerably in both length and scope. The film stars new-comers to the Dan Allen Films Universe; William Fisher and Jamie Weston, whilst seeing the return of Ellis Winn (Vinny in ‘Husky’) as the Dojo Master who takes Nigel under his arm. My Brother D.O.P’d the film, using his experience in photography to bring a new visual experience that is both clean and stylistic, with a key emphasis and symmetry and movement. My new film ‘The Karate Kid Complex’ is available NOW on the virgin media shorts website via this link: http://karatekid.danallenfilms.com and i would really apreciate your help in watching the film and clicking on one of the ‘share’ buttons on the page, which will help us try and acheive the people’s choice award – an achievement that would be simply amazing! But, like is said, this cannot be done without your support as the people’s choice goes to the most shared film and i’d really, really appreciate your help. I hope you guys like the film and thank you for your time you have taken to read this film. I am excited to announce that i am currently working on an exciting new short film with Colchester Filmmakers! The film is called ‘If Looks Could Kill’ and was written by a very talented writer, Gary Kittle. It is a black and white thriller set in the year 2018, in a world in which all women are infected with a deadly skin desiese. The film stars a couple of people from my previous short film ‘Husky’,namely Steven Johnson and Megan Vickers, who will be joined by Clive Hill, Stacey Wood and Penelope Read. Below is a teaser trailer for the film, which is half way through production.